Major parts of the gastropod shell shown on a specimen of Cymatosyrinx aclinica from the Tamiami Fm. (Pinecrest Beds) of Florida (PRI 70050). This work by the Digital Atlas of Ancient Life is licensed under a Creative Commons Attribution-ShareAlike 4.0 International License. Aperture: The opening of a gastropod shell, in which the animal once lived. 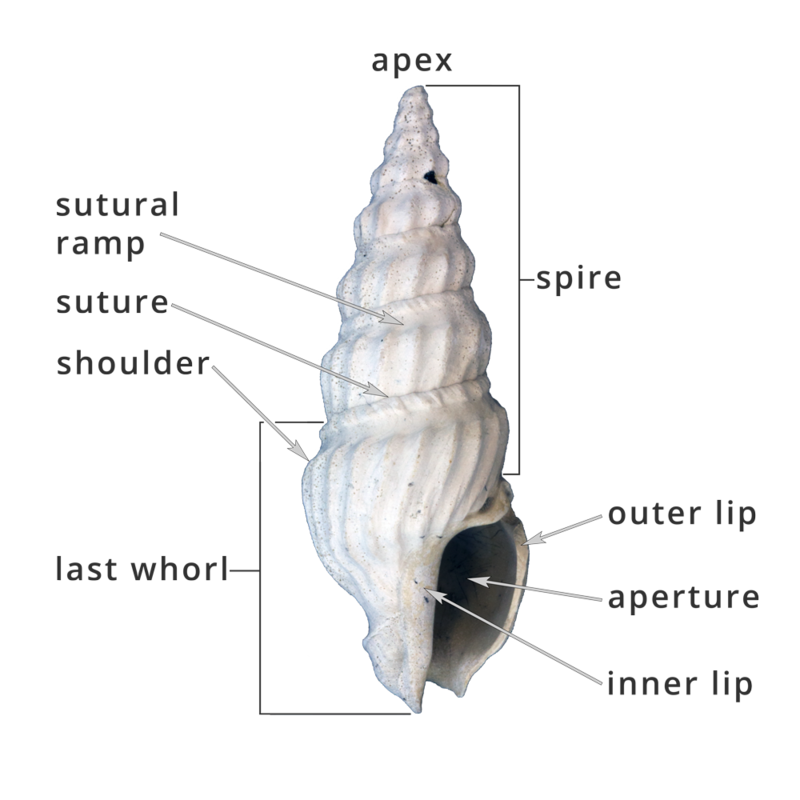 Apex: Youngest and posterior-most part of the spire; informally called the “tip of the spire.” In especially well-preserved specimens, the larval shell, or protoconch, may be preserved at the apex. Inner lip: The adaxial margin of the aperture. Last whorl: The anterior-most portion of the shell and the youngest whorl of the shell. Because much of the living animal’s body occupies the last whorl, this interval of growth is sometimes also called the body whorl. Frightened snails are able to retract their bodies into the last whorl for protection. Outer lip: The abaxial margin of the aperture, where new shell growth is deposited. Shoulder: The anterior edge of the sutural ramp, sometimes associated with the position of maximum diameter of the last whorl. Spire: Whorls of shell growth preceding the final half turn of the last whorl, including the protoconch and the teleoconch. The term comes from this structure’s similarity to the pointed, cone-shaped spires of cathedrals. While most gastropod species have a spire, species that do not grow downwards along their axis of coiling (i.e., do not exhibit translation) don’t, as earlier whorls are covered by subsequent shell growth. Sutural ramp: The spiral band located between the shoulder and the suture. Suture: The line separating one whorl of growth from the preceding whorl, often represented by a groove. 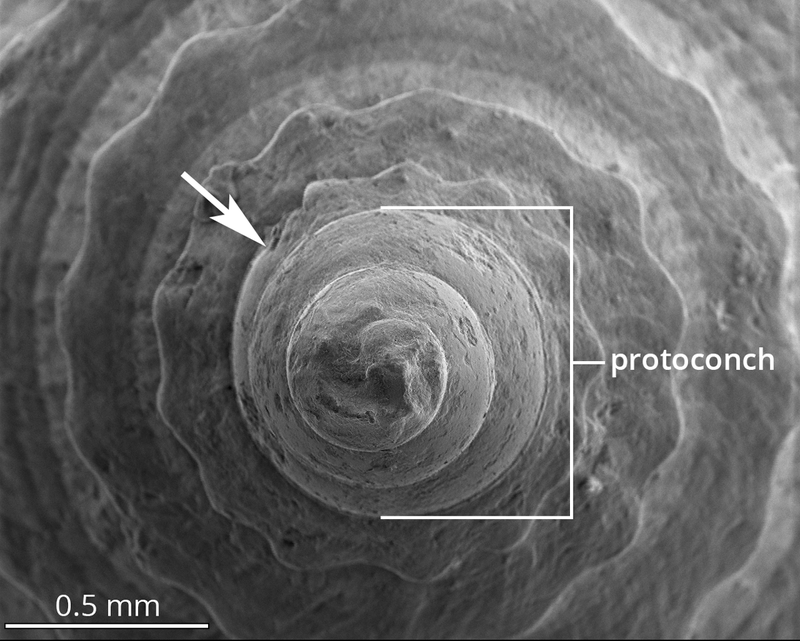 Scanning electron photomicrograph (SEM) image of a larval shell of a fossil cone shell from the early Pliocene of the Dominican Republic (PRI collections). The arrow indicates the boundary between the protoconch (larval shell) and the subsequent teleoconch spire whorls. Protoconch: The larval shell of a gastropod, present when the animal first emerged from its egg. Because of their fine features, protoconchs are absent from adult shells, owing to either erosion or breakage. They are more commonly preserved on juvenile shells. Teleoconch: all whorls of the spire, except the protoconch. The boundary between the protoconch and teleoconch is sometimes indicated by a change in shell morphology, such as the formation of ornamentation. A broken fossil specimen of Cancellaria showing internal features of the shell. Specimen is from the Late Pliocene Tamiami Fm. (Pinecrest Beds) of Florida (PRI 70056). 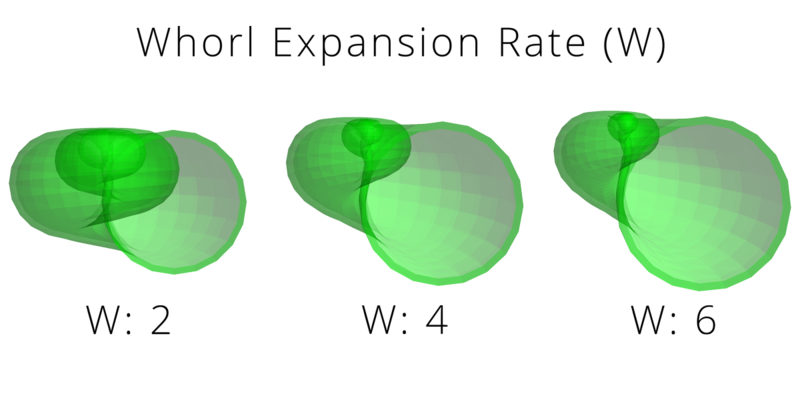 Axis of coiling: an imaginary line around which the shell grows. This line runs from the apex of the spire (posterior end of shell) to the anterior end of the shell. Columella: an internal feature that surrounds the axis of coiling, forming a central pillar around which the rest of the shell is built. Columellar lip and folds: the portion of the anterior end of the shell that will later become part of the columella; it is sometimes ornamented with rib-like structures called columellar folds, which do not have a well established function. The image below shows a fossil specimen of Strombus in life position. The opening of the shell (aperture) defines the ventral surface; the opposite side is the dorsal surface. Because gastropod shells grow by coiling about an axis, parts of the shell that were once “ventral” eventually become oriented dorsally as new shell material is deposited over older material. The anterior side of the shell is the “front end” (i.e., is located near the head); the posterior side of the shell bears the spire (if present). 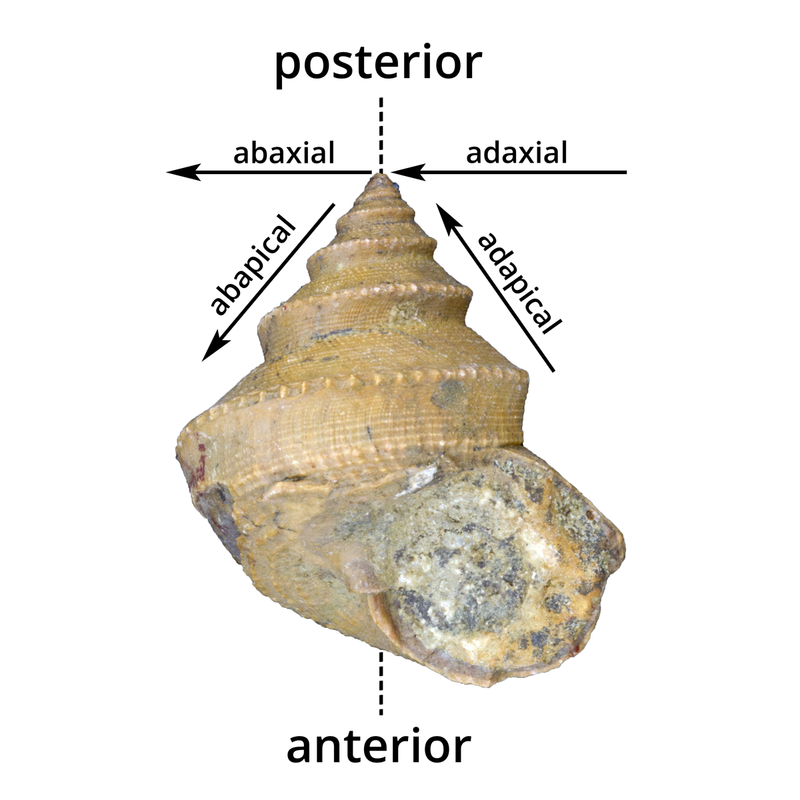 Orientation of a gastropod shell in life position. Specimen shown is a fossil Strombus from the Late Pliocene Tamiami Fm. (Pinecrest Beds) of Florida (PRI 70052). 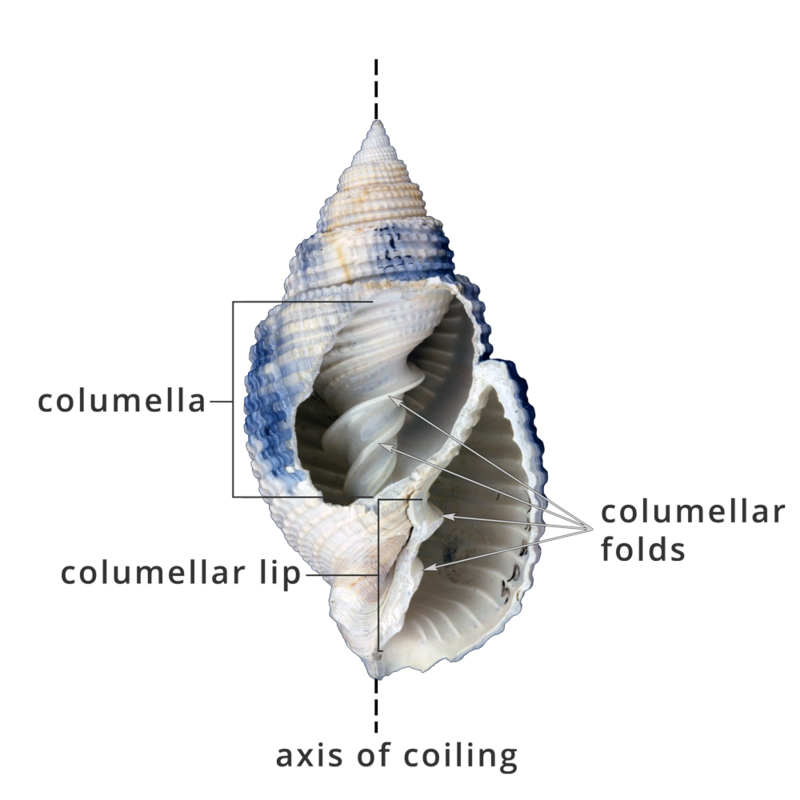 When describing gastropod shells, it is often useful to characterize the positions of certain features relative to the apex of the shell or its axis of coiling (see above). The Latin prefex “ab-” means “away from.” Thus, features that are positioned away from the apex are called abapical and features that are positioned away from the axis of coiling are called abaxial. The Latin prefex “ad-” means just the opposite: “towards.” Therefore, a structure positioned towards the apex is adapical and a structure positioned towards the axis of coiling is adaxial. A fossil specimen of Worthenia tabulata from the Pennsylvanian Vamoosa Fm. of Osage County, Oklahoma (PRI 70108). Rate of whorl expansion (W): measurement of how rapidly the size of the generating curve (i.e., the aperture) expands. Rate of translation (T): measurement of how rapidly (or if) the shell grows down the axis of coiling. Distance of generating curve from the axis of coiling (D): measurement of how tightly coiled a shell is. “Unwound” gastropod (and ammonite cephalopod) shells have high values of D.
These terms are very useful for describing and comparing the shapes of different gastropod shells. In combination, they also reasonably approximate the forms of some living and fossil gastropods, as well as other mollusks. Resman et al. (2011) recently developed a fun software tool for modeling gastropod shell form based on Raup’s three parameters. This program–called “Shell Parameter Space” can be downloaded http://demonstrations.wolfram.com/ShellParameterSpace/. Note that using this program requires first downloading the free software Wolfram Demonstrations Project, accessible at http://demonstrations.wolfram.com/. The simulated gastropod shells shown below were generated using this program. Effects of increasing rate of whorl expansion (W) while holding D and T constant. Generated using “Shell Parameter Space” by Resman et al. (2011; http://demonstrations.wolfram.com/ShellParameterSpace/). Effects of increasing rate of translation (T) while holding D and W constant. Generated using “Shell Parameter Space” by Resman et al. (2011; http://demonstrations.wolfram.com/ShellParameterSpace/). Effects distance (D) of the generating curve from the axis while holding T and W constant. Generated using “Shell Parameter Space” by Resman et al. (2011; http://demonstrations.wolfram.com/ShellParameterSpace/). Modifying the three Raup parameters (W, D, and T) in combination results in many shell forms that approximate those of fossil and modern gastropods. Left: specimen of the naticid gastropod Naticarius plicatella from the Tamiami Fm. (Pinecrest Beds) of Florida (PRI 70044). 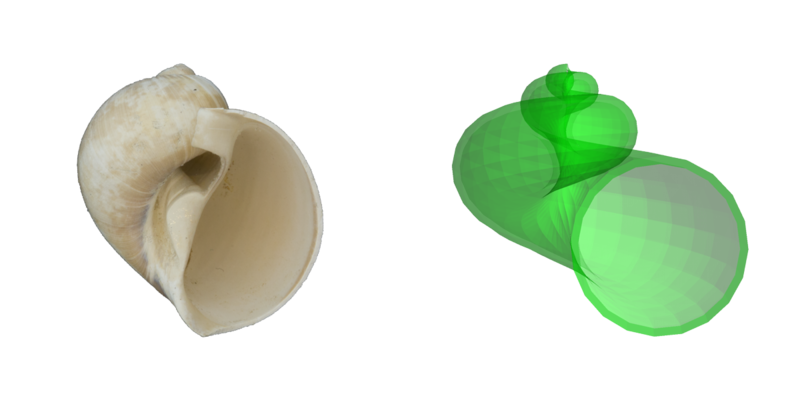 Right: simulated shell generated using “Shell Parameter Space” by Resman et al. (2011; http://demonstrations.wolfram.com/ShellParameterSpace/). 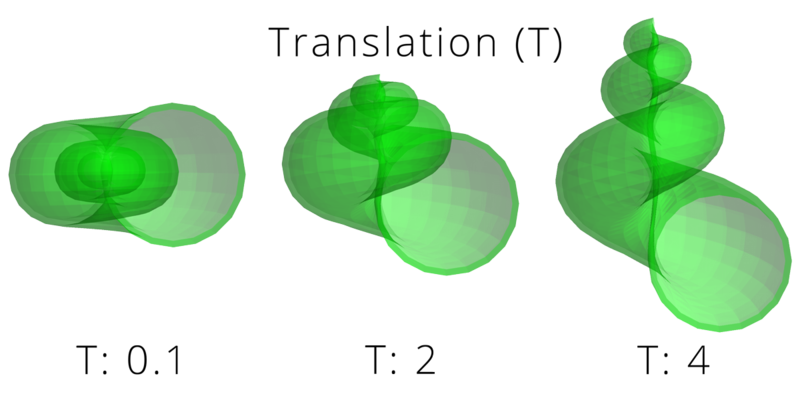 Very interestingly, Raup (1966) found that many theoretically possible shell forms have never been realized in nature. The reasons why this is true are fascinating to consider and range from architectural constraints on form to regions of morphospace that have never been “explored” in the history of mollusk evolution. Raup, D. M. 1966. 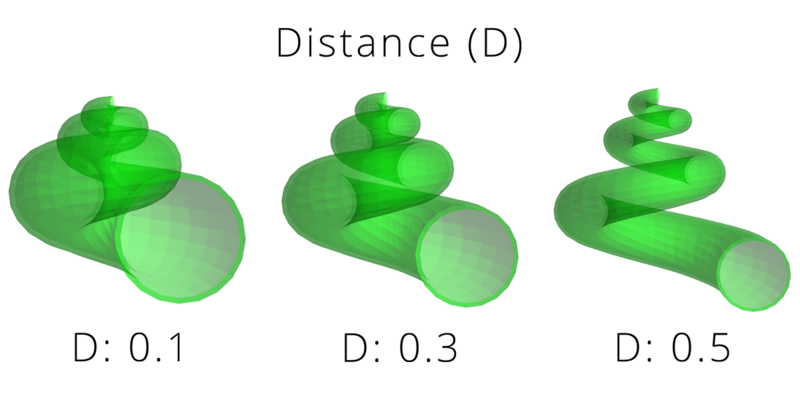 Geometric analysis of shell coiling: general problems. Journal of Paleontology 40: 1178-1190. Link. Resman, J., M. Winerip, E. Cowdery, and A. Reed-Harris. 2011. Shell Parameter Space. Wolfram Demonstrations Project: http://demonstrations.wolfram.com/ShellParameterSpace/.